Satsuma Kuro Godai - Kampai! : Kampai! 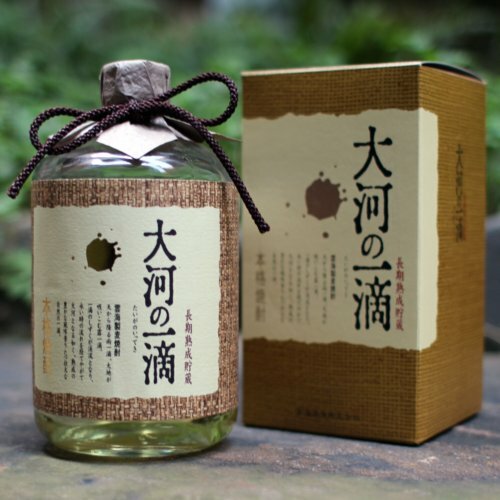 Distillery: Yamamoto Shuzo Co, Ltd. Unlike the sister shochu, Satsuma Godai, made with white koji, Kuro Godai lacks the sketch of a Japanese historical figure on the label. However, it retains the poetry – “History dances on a tongue”, which remains just as esoteric if you are not aware of the rich history of the brand. Yamamoto Shuzo, opened in 1912, celebrated 100 years of shochu tradition earlier this year. Kuro Godai, with the rich, dirty flavor so prevalent in black koji sweet potato shochus, adds a dimension to this richness by opting for an unfiltered approach. Nigori (unfiltered) sakes are cloudy, white, and sweet. Unfiltered shochus, known as muroka, are still clear, but have a overtly rich, buttery mouthfeel not found in filtered shochus. The only telltale sign that this is a muroka are the droplets of spirit that cling to the walls of the bottle. 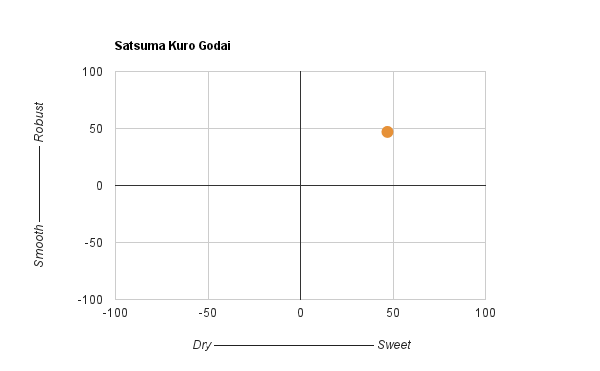 In the case of Kuro Godai, this all combines to make a sweet, dirty, rich shochu in aroma, flavor, and finish. There is a hint of cinnamon on the tongue afterward, but you have to be looking for it. Muroka shochus are uncommon in the US market. Further, the shochu producers do not advertise them as such, so it takes some detective work (bottle inspection) to find them. They’re worth trying if only for the variation on the filtered versions. For Kuro Godai you could compare to Kuro Shiranami or Kuro Kirishima. To fully enjoy the richness of this shochu, drink with a little cold or hot water rather than cutting with ice, which will dilute the flavor too much. I really like this imo shochu, too! 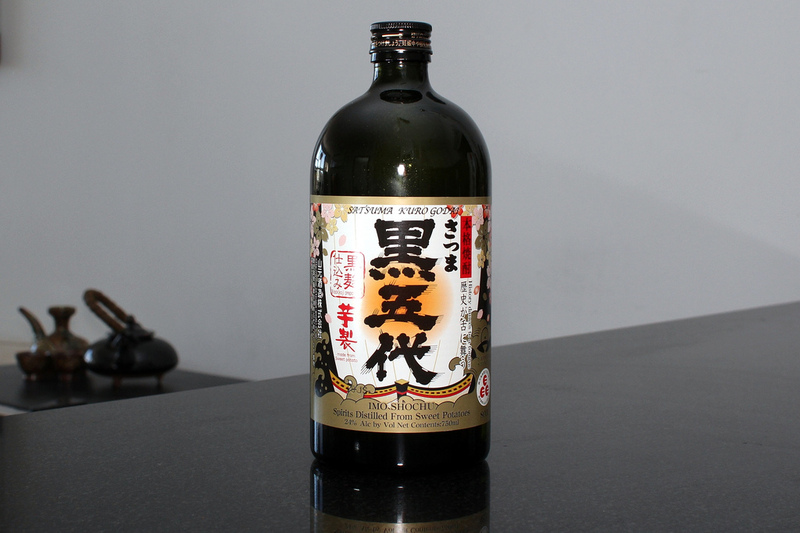 Have you guys tried Nakanaka shochu? It is a rice shochu that is then aged in cedar casks. It is sold in beautiful ceramic flasks. Nakanaka Nai is available in the US and sold in ceramic pots. Apparently Nakanaka is available in France and other countries. Not sure if it’s the same brand (kanji looks different), but I’ll do some research. Nakanaka Nai is what I’m talking about. I just drank a bunch of it tonight! I’ve been eyeing Kaido iwai no aka for well over a year. 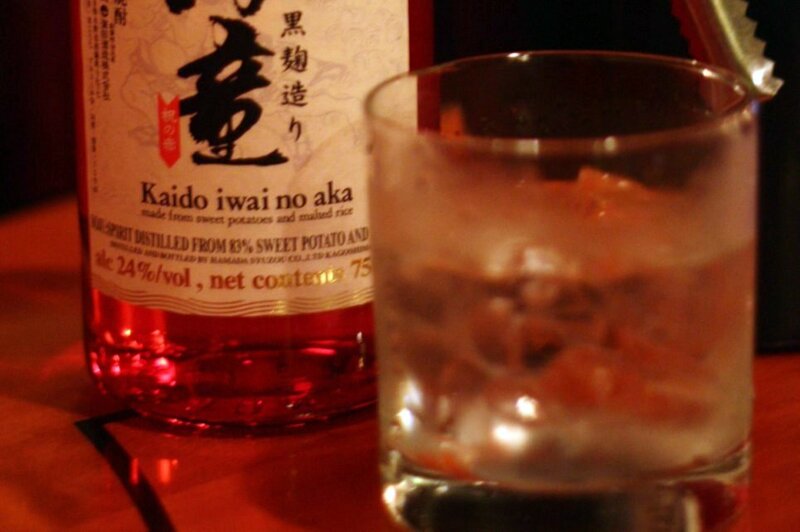 The stunning red bottle is undoubtably alluring and “iwai no aka” refers to the celebratory red color of the bottle. The shochu, however is clear. I remember sitting at an izakaya in midtown Manhattan and watching enviously as a Japanese customer poured from the gorgeous bottle. Kagura no Mai, with its plain black and white label with abstract drawings of village life, doesn’t shout from you off the shelf. Nor does is grab you out of the glass. It’s light and clean with the forward aromas of sake yeast. This leads me to believe it’s a low pressure distillate and that the distillery has chosen to use a traditional sake yeast rather than one of the more neutral shochu yeasts.